If you were to visit the Mustang and Wild Horse Rescue of Georgia’s (MWHR) 6-acre pasture in Canton, Georgia, or its 30-acre pasture in Talking Rock, you might see a lot of horse play. 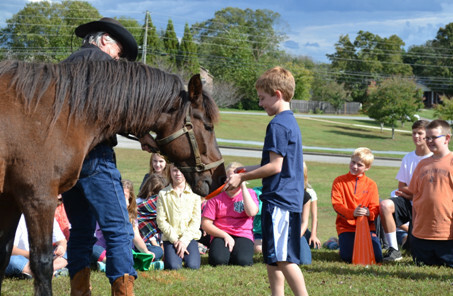 However, there is no fooling around when it comes to the 4th- and 5th-grade students of Roswell, Georgia’s Sweet Apple Elementary School (SAE) Interact Club’s ability to raise money to support these horses! On Wednesday, February 18th, the Interact Club, a Roswell Rotary Club pilot in its second year, presented a check to MWHR in the amount of $3102.55, a goodly sum of money raised by this group of 39 tender-aged members! Rotary Interact Clubs give students the chance to make a real difference in the world while having fun. It is an organization of young people whose purpose is to provide an opportunity for them to work together in a world fellowship dedicated to service and international understanding. Its primary emphasis is to train young people to develop leadership and citizenship skills, two critical soft skills in the contemporary workplace. This year, the students of the SAE Interact Club, after a visit from a MWHR wild horse, chose to help raise money to support the horses and wild burros rescued by MWHR. This particular project is not just a project; it is a love story. It is the story of budding love between a young horsewoman, Bella Rosado, and a wild mustang named Buck. 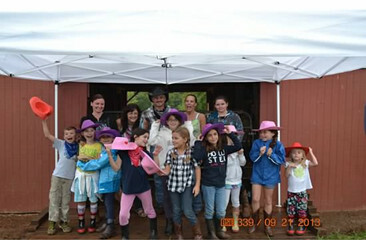 The story began when Bella’s mom, Alba Rosado, honored her daughter’s love of horses and hosted Bella’s 10th birthday party at MWHR’s barn in Canton. All of Bella’s birthday gifts were donated to the rescue. Enchanted by the horses, Bella and Alba teamed up as volunteers to work with the rescued horses and wild donkeys. Together, Bella and Alba fed and watered them, shoveled manure, and learned natural horsemanship from MWHR Founder David Hesse. On September 21, 2013, Bella touched a wild mustang for the very first time. 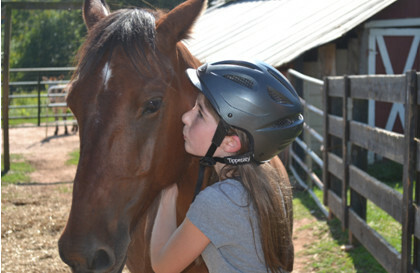 Then, in April 2014, MWHR rescued yet another horse whose life was not only saved but whose own act of living ultimately impacted the lives of all 39 students, volunteers, and teachers of the Interact Club. That horse was Buck. was greatly loved and cared for but he would not allow anyone to touch him; not until Bella, that is. Despite his very sick condition, or maybe even because of it, Bella loved Buck with her whole heart and took good care of him. She spent minutes, hours, days, weeks, and, yes, months spending time with him even though he would not let her touch him. At last, one day, Bella’s devotion won Buck’s trust and he let her be the very first human being to pet him. Their bond was sealed. 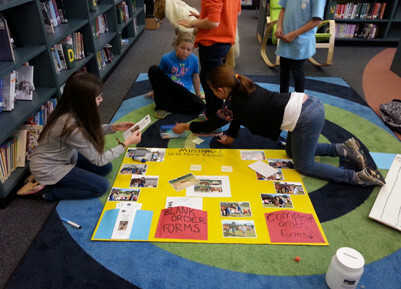 In an era in which employers nationwide are begging for employees who have good soft skills, these elementary-school-age members of the Interact Club have proven themselves to be industrious, compassionate, focused, tenacious and value-driven. Natural leaders emerged with Bella Rosado and her friend Charis Philo, a classmate and neighbor who spends time with Bella out at the MWHR barn in Canton and who ended up falling in love with a wild burro named Fred, rallied the human herd of club members to raise money to help support their mission of taking care of Buck and his horse and donkey buddies at the rescue. With the aid of Bella’s mother, Alba, who co-chairs the club, they lead a class in which they asked what each member could do to raise money. They compiled a list of items on a flip chart and challenged their peers with sales goals. Modeling adult sales managers, they provided club members with an incentive: every member who raised $150 or more would be eligible to attend a picnic hosted by the rescue at the Canton location. the American people.” The Mustang population is managed and protected by the Bureau of Land Management (BLM), a division of the U.S. Department of Interior. Many methods of population management are used, including the adoption by private individuals of horses taken from the range. Animal rights activists advocate for these Mustangs arguing, for instance, that the BLM violated the law by excluding the public from the decision about how they implement birth control of the horses. They also assert that the methods employed during the round-ups, including the use of helicopters, are inhumane. Additionally, there is significant controversy regarding sharing government land and resources between the free-ranging Mustangs and the livestock of the ranching industry. Although both sides strongly believe that they are protecting America’s Living Legends, it will take considerable more work before opposing sides can agree. MWHR is a local 501(c)(3) organization founded in 2002 by David Hesse. After his first trip to the high desert country in California where he learned how to gentle a wild mustang, Hesse, whose passion is to preserve the Mustang, opened a training center to teach new mustang adopters how to safely gentle their wild horses. A couple of years later, he founded MWHR. It is committed to providing a safe haven for previously owned mustangs and wild horses that are no longer wanted by their adopters or those who have been abandoned, abused or neglected by their owners. The horses had originally been placed for adoption by the BLM Adoption Program. MWHR gentles and rehabilitates the horses they rescue so they can be successfully re-adopted by new owners. 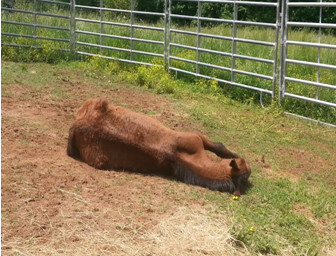 MWHR’s goal is to obtain land in the near future to provide a sanctuary for unadoptable mustangs. It is also devoted to raising public awareness of the plight of wild horses and burros and why saving these Living Legends is critical to our nation. 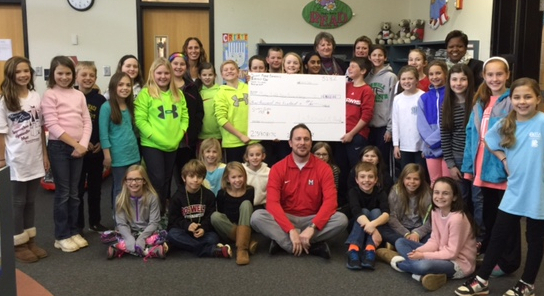 MWHR hopes to inspire others to become involved in their worthy cause. MWHR is run entirely by volunteers; donations and interest are always welcome and greatly appreciated. For more information about MWHR or to make a donation, please visit their website at mwhr.org or contact David Hesse at 404.667.7393.